The Fourth of July is a fun day to celebrate with family and friends. We often spend the day swimming in the pool, eating hamburgers and potato salad, and watching fireworks. 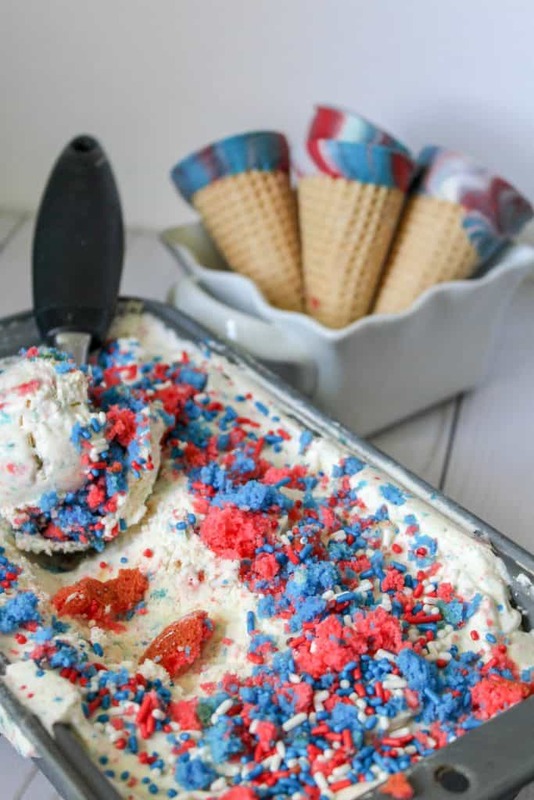 There are so many fun 4th of July desserts that make the day festive and fun. I love decorating with red, white and blue and invited the entire family over for some fun. 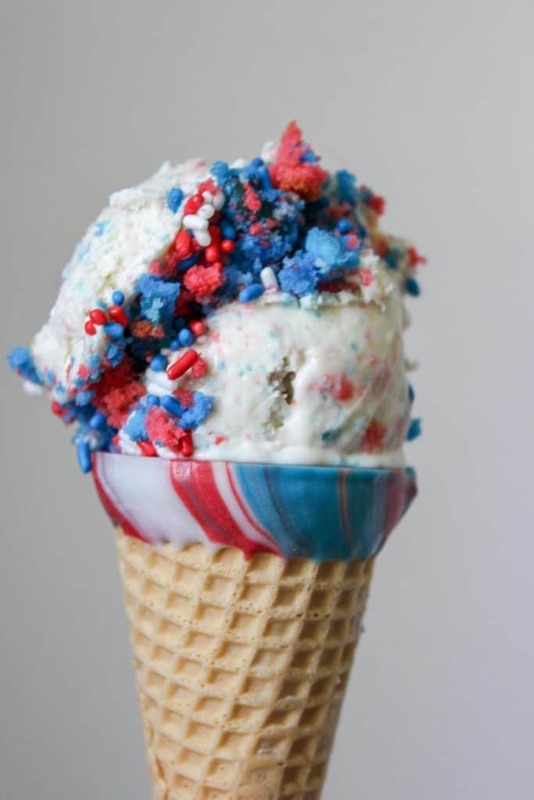 The summer is a great time for delicious ice cream, so you are sure to love this 4th of July Ice Cream. Make your cake mix according to package instructions. Divide into 3 bowls. Color one red, one blue and leave the last white. Pour into a cupcake pan and bake according to instructions. Allow cupcakes to fully cool and crumble them. In a separate bowl, pour in 1 can sweetened condensed milk. Add 1 tbsp vanilla and the vanilla pudding. Mix well. Add in about 1 cupcake each red, white and blue. Stir to mix. Combine your red, white and blue mix to your whipped cream. 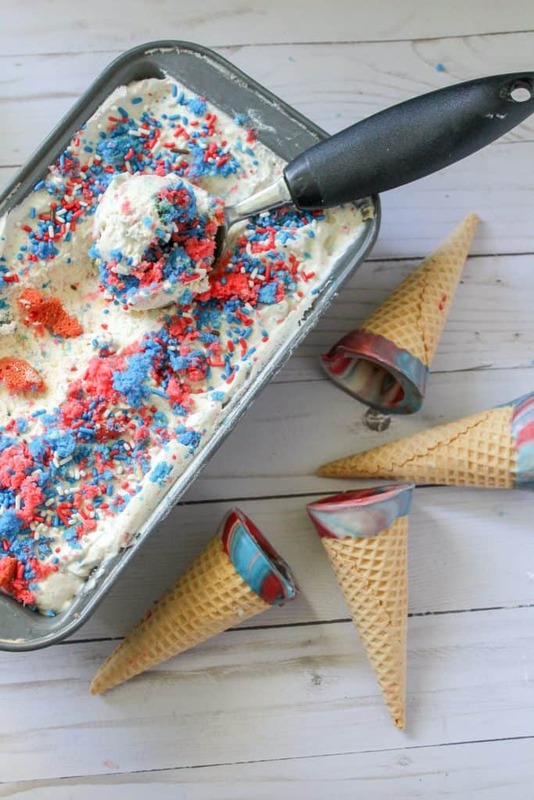 Fold in the patriotic mix carefully to keep your cream nice and whipped. In a metal loaf pan, pour about half of the mixture. Layer the top with crumbled cupcakes and pour the remaining ice cream mixture on top. Crumble one last time with cupcake crumbles and sprinkle with sprinkles. Cover with press and seal or plastic wrap and freeze for 24 hours. Lay out a sheet of wax paper on your counter to work on. In three separate bowls, pour your candy melts. Melt according to package instructions. In a small dish, pour some of each color into the bowl making sure you have enough to dip the cone into. Using a toothpick or a knife, gently swirl the candy melts around to mix. Dip a cone into the candy melts. Place the cone on the wax paper to harden.